Our success not only comes from producing #1 Quality tools, but also from our unparalleled service. From our Customer Service Representatives to our extensive Sales Team and Product Specialists, Makita is dedicated to delivering complete customer satisfaction. 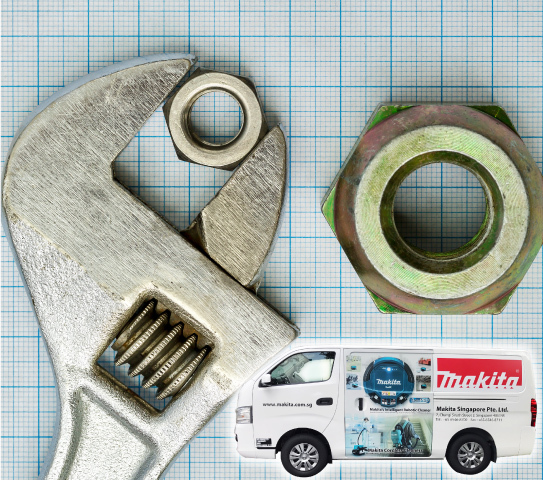 For power tools that need to be serviced or repaired, it is reassuring to know that Makita is there with a comprehensive service. warranty against defective materials and manufacturing defects for a period of 6 MONTHS. Sales receipt must be presented when servicing or warranty is required. Warranty ONLY cover tools distributed by Makita Singapore Pte Ltd. Warranty does not cover tools purchased overseas or distributed by other countries. This warranty is ONLY valid if the warranty registration is returned to us within 7 DAYS from the date of original purchase. The product unit has undergone repair, attempted repair, dismantle or modifi­cation in any way whatsoever by any other person. Damage resulting from negligence, accident, disaster, improper storage or maintenance, abuse and misuse in evident caused by overloading the tool beyond its capacity. Abnormal voltage or usage of generator, wrong usage not in accordance with the Operation Manual. If the Serial Number on the tool, seal on the battery and charger has been defaced or removed. No.28, Sabai Street, Thirimon Plaza, Bayint Naung, Mayangone Township, Yangon, Myanmar. No.3, Room 4/5, Botayaung Pagoda Road, Pazundaung Tsp, Yangon, Myanmar. PaPa-21/59+60, Corner Of YawMinGyi Rd & Padonma St, Bet: 65 & 66 Street, Industrial Zone(1), Mandalay, Myanmar.